I can see looking at this the love and friendship you share with Masako. It is so delicately drawn and those kind eyes have such a light captured in them. Deb, This is BEAUTIFUL! What a lovely portrait. What a wonderful painting this is! A beautiful portrait, it feels very real! 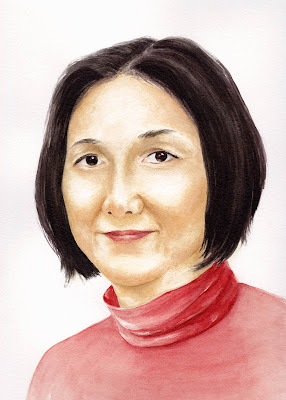 Debra you really know how to do it all , this watercolor portrait is fabulous, beautifully captured expression and look in the eyes! Lovely watercolor portrait. The lighting on the face compliments beautifully. Beautiful, Debra! I knew before i clicked that your portrait would look professional already! Beautiful. I don't think that you have done many portraits before this.